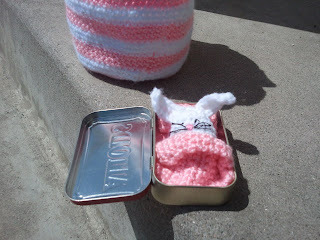 I decided to make Mims an Easter basket this year, since she has lost my beloved Peeps basket, and I didn't want to spend $12 to buy her a mass market superstore plastic one. Not that that's my issue, just that I'm cheap and I'm trying to raise her to think that homemade + not like everyone else = cool. 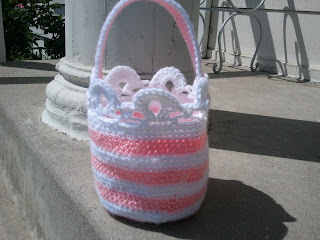 Plus, my mom bought her a beautiful basket for the church Easter Egg Hunt, and I wanted to control the size of the basket that the Easter Bunny had to fill, since I'm not super into loading her up on ten pounds of sugar (like ANYONE thinks that's a good idea. Please insert eyeroll here.). So this is what I came up with. Simple and small, but it's got a little sparkle, so of course Mims loves it. 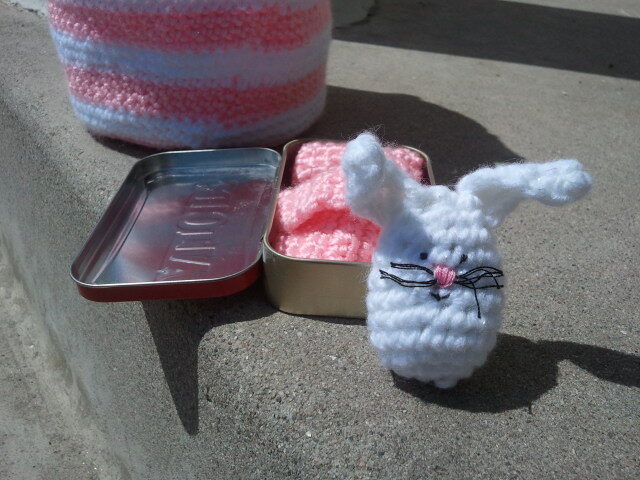 I also made this little bunny box for her to play with. I would have given it to her from the Easter Bunny, but as you can see, I used the same yarns as her basket, and Mims is pretty savvy. Also, she saw me working on the bunny, and even though she thought I was just making an egg, I'm pretty sure that it wouldn't have been too long before she figured it out. And I'd like to let her believe in magic for just a little while longer. Free-range bunny, out of the box. Hi Lisa! Thanks for checking them out.